Paul Davis will conduct a new work by Kim Portnoy. 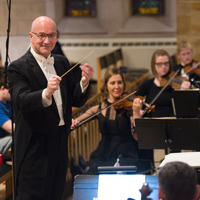 The Webster University Orchestra, under the direction of faculty member Paul Davis, will perform a new work by Kim Portnoy on Sunday, Feb. 25, at 7 p.m. at the Stage of the Community Music School. Both are associate professors in the Department of Music in Webster's Leigh Gerdine College of Fine Arts. The composition, entitled “Ink on Water,” is the middle movement of an orchestral suite composed last year as a sabbatical project. The suite, “Three Pieces After Pictures by Benson Portnoy,” is inspired by the digital fractal computer art of the composer’s brother, Benson Portnoy, who spent many years as a computer systems analyst and designer, has in his retirement produced a series of pictures that are colorful, evocative and whimsical. Also featured on the program is Department of Music professor Daniel Schene, performing the iconic “Piano Concerto in A minor,” by Edvard Grieg. The composition is hailed as one of the most performed and recognized pieces in the solo piano repertoire. Completing the program will be “Russian Easter Overture,” by Nicolai Rimsky Korsakov. The overture is a poignant setting depicting the reverence of Russian Orthodox chant themes juxtaposed against music representing vibrant pagan celebrations that immediately follow the Easter season. Guest conducting is Webster University graduate student Luiz Botelho-Gomes. Admission is free to students, staff and faculty with ID.